An automated liquid handling robot that prepares 24 chromosome slides for banding or 12 FISH slides for hybridization. Precisely dispenses microliters of fixed cells for G-banding in a humidity-controlled chamber for optimal chromosome spreading. 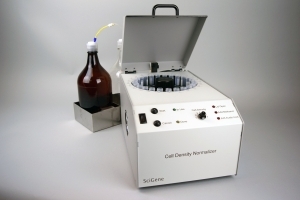 Dispenses fixed cells and probes for FISH; ready for coverslipping and hybridization. Patient information may be entered by barcode scanning or manually. The robot monitors probe tube volumes creates detailed patient reports and produces score sheets for slide readers. Scorpion Slide Preparation Robot. 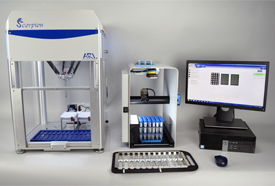 Includes automated pipetting unit and humidification system with PC computer. Covered by 12 month hardware and software warranty. Scorpion Software and Hardware for Chromosome Slides. Scorpion Software and Hardware for MicroFISH Slides. Scorpion Tips, 50 µl, 96 tips/rack, 24 racks/case. Scorpion FISH Probe Tubes, 50/pk. Includes: Automated pipetting unit and humidification system with PC computer.